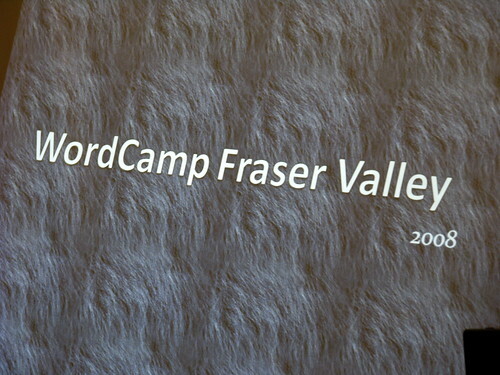 Apologies for not promoting this event sooner, but WordCamp Fraser Valley is going on right now. In fact, Raul is up in the front of the room and giving his presentation on switching to WordPress from Blogger, so we are in full swing out here in Langley. Rebecca is doing her best to live blog most of today’s event, so head over there to get more information. It’s worth noting these types of events for being great places to meet other WordPress users. There is also a wealth of ideas that we find by attending gatherings like this. Whether it’s finding your voice as a blogger or discovering new tools to make your postings better, finding events like these are worth your time when it comes to wanting to find out more by what you can do with your blog. Update: There was a question raised during Rebecca’s presentation that prompted me to make a quick blog post on my personal blog about “Designing drop down menus with CSS on WordPress“. This is something that we did for one of our clients, No Boundaries.org. If you are curious about this topic, please check out my post there. Posted in Events, WordCamp, wordcamp fraser valley, wordpress and tagged miss604 live blog, WordCamp, wordcamp fraser valley, wordpress.